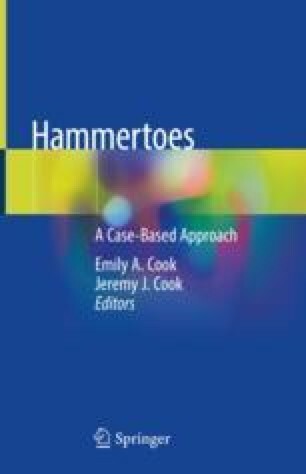 There are numerous plastic surgery techniques that can be utilized for hammertoe correction. Skin plasties, advancement flaps, and transposition flaps are useful adjunctive techniques. These local flaps allow for reorientation of tissue, exposure of underlying bone and tendon for reconstruction, release of scar tissue, and prevention of recurrent deformity. This series of plasties and flaps are unique in their movement and geometric pattern and are considered adjacent tissue transfers that include the epidermis, dermis, and subcutaneous tissue. The broad success of these flaps has evolved from the basic concept that the next best skin is the nearest skin as described by Gillies (Br Med J 2(3752):1008, 1932). The indications for a transposition flap or advancement flap for hammertoe surgery can include congenital deformities, burns/scar contractures, mucoid cysts or painful lesion removal/biopsy, and revisional digital arthroplasties/arthrodesis. The techniques that will be discussed in this chapter are the bilobed flap, Z-plasty, double Z-plasty, V-Y plasty, Y-to-V plasty (Butler procedure), and modified Bruner incision.